…YES, at the same time! It is ok to feel a range of emotions about breastfeeding. Now that your baby is here you may feel like all they do is feed and sleep. Every drop of breastmilk your baby gets will help them to grow and develop as they should, so well done! Many mums find breastfeeding a special and rewarding experience, but looking after a new baby is hard work too. For some mums, breastfeeding is one of the first challenges of parenthood. 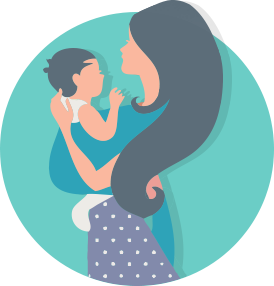 The content in this section aims to support you to overcome some of the more common breastfeeding difficulties, and provide reassurance about what is normal for a breastfed baby. Public understanding and attitudes to breastfeeding are improving, so don’t be afraid to get out there. Responsive feeding means feeding your baby in response to their needs, and not according to a routine. Many of the difficulties that mothers experience in the early days can be overcome. Don’t hesitate to ask for help. There is plenty of support available if you need it.